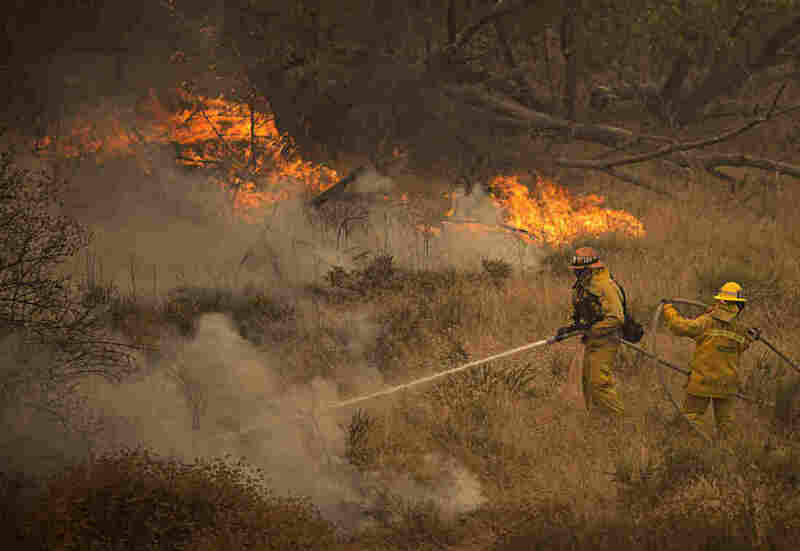 Some Evacuation Orders Lifted In Southern California Wildfire : The Two-Way The body of a man was found in an area burned by a 33,000 acre wildfire north of Los Angeles. The Sand Fire has destroyed more than a dozen homes and is one of 19 major fires burning in California. Firefighters battle part of the Sand Fire after flames jumped across a road in Santa Clarita, Calif., on Sunday. As the blaze changed direction multiple times over the weekend firefighters were forced to retreat and thousands of people have been evacuated from their homes.